When it comes to digital advertising, you can measure your ROI, or return on investment, in numerous ways. Your content marketing efforts might seem difficult to quantify, but you can get a good idea of your progress and performance using these strategies. You don’t have to pay for organic traffic, which makes it inherently more valuable. Even if you don’t participate in paid search, you can use CPC, or cost-per-click, rates to measure the value of your content marketing through organic search. According to the Content Marketing Institute, this is the simplest way to measure the ROI of your content marketing. Choose a measurement period, such as six months, and select several pieces of content. Visit Google Analytics to determine how much organic traffic each piece of content received during the measurement period you chose. Next, figure out the CPC for the primary keywords you used in the content you’re measuring. Multiply the organic traffic numbers by the CPC to learn what you would have paid to generate that traffic through AdWords. 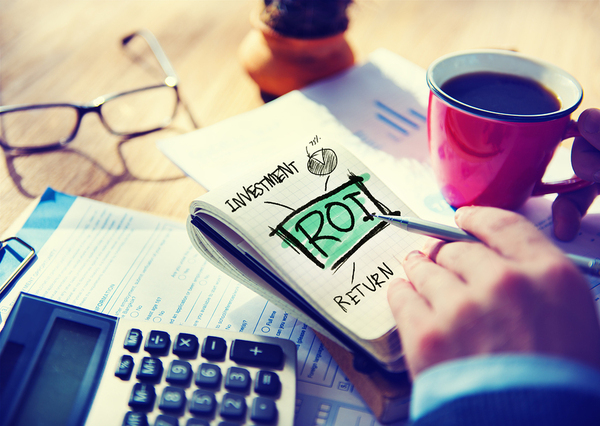 Run these numbers every six months to evaluate whether you’re getting more or less ROI. When you develop relationships with your audience, your brand lift increases — as does your ROI. Content marketing can help you achieve many digital advertising goals, but brand lift remains one of the most popular. When your target customers get exposed to your brand, they form opinions of your business based on what they read. Contently suggests using accurate survey tools to measure brand lift. Vizu, a survey tool dedicated specifically to brand lift, offers a unique advantage in that it can measure brand lift through control groups. In other words, you’ll learn how people respond to your brand based on the number of times they’ve been exposed to it. When you measure brand lift over time, you’ll get an excellent picture of your brand visibility and loyalty. When more people report positive experiences with your brand, you’ll know that your content is increasing ROI. If you’re looking for a more dollar-specific way to determine the ROI of your content marketing, set conversion goals for your brand and assign those goals a dollar value. Ideally, focus on conversion factors that relate specifically to content marketing, such as email subscriptions, bounce rates, and time on page. You can then measure the dollar values for each goal over time. You’ll learn whether your content has helped you achieve your goals or hindered your progress. Additionally, if you analyze different pages, such as blog articles, you’ll discover which types of content help boost your ROI. Consider creating a campaign for a specific metric. For instance, write an ebook in which you think your target audience will express interest. Assign ebook downloads a dollar value, require readers to sign up to your email list through a dedicated form, and track downloads on each page of your blog or in every email. Knowing your content marketing ROI will make your digital advertising campaign more precise and can even influence the future of your marketing efforts. To learn how we can help speed up this process, contact our Business Development Manager, Amanda Sparks.